← Inspiration–Got It? Need It? For the past couple of days I have had the joy of boundless creative energy! Whereas before nothing creative appealed to me, now everything appeals to me. Last week before the heavy wet snow brought down trees and branches I was walking through my garden and saw two beautiful red roses blooming. What a surprise! The weather has been down to the 20s and even the teens at night but here were these gorgeous flowers still bursting with beauty–and fragrance! I have several rose bushes in my garden of different types and colors. This particular rose bush is not large. It is tucked in the corner all by itself. But this solitary bush is a very special one. It’s blooms have the most intoxicating scent. When you put your nose to one of it’s flowers you feel the scent in your whole body. Some roses look like the most beautiful rose but you have to sniff twice to really get the scent. Not these blooms–their scent speaks ROSE to the rooftops! 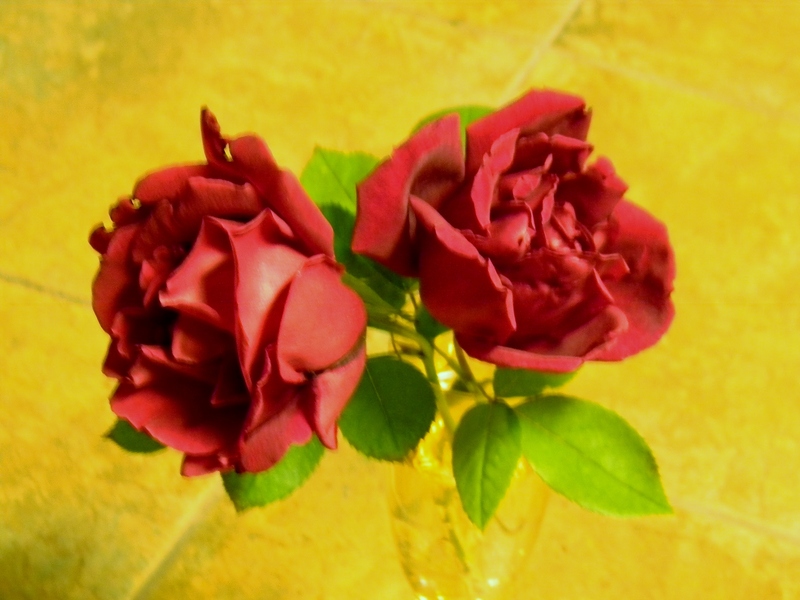 It was supposed to snow heavily that night so I cut these last two beautiful roses of the season and took them into my kitchen. Somehow a mere vase didn’t seem to do justice to their celebration of beauty so I put them in a champagne glass. It just seemed much more fitting. Great blog! I am nominating you for the Versatile Blogger Award! Thank you so much Michele–I appreciate the pat on the back! You are so expressive in your thoughts! The roses are so lucky to have been in YOUR Garden! Thanks for following Bongo’s blog. Thought I’d check yours out and follow it as well. Love the roses. Cheers to beauty in small places! You inspired me and I’m going to smell the roses more often. Thanks so much! You are definitely a flower in the garden of my life!